In today's video market cheap competition appears to be the biggest complain and problem amongst video makers. The reality is that the market is changing constantly, the days of sitting in our offices and waiting for the phone to ring are gone. In the past we always relied on our skills and quality to keep our business going, unfortunately those days are gone. Today to make it we have to be proactive. If 15 years ago I would have gone around saying that one day guys with little knowledge and with toy cameras would put many of us out of business I would had received the same reaction as if I would had said that Kodak one day will file for bankruptcy, guess what. Cheap competition is nothing new. This problem for us started back in the late 80s when SVHS and HI8 cameras were first introduced. Manufacturers categorized these new inexpensive cameras as “industrial”. They also had inexpensive editing VCRs to form complete affordable turnkey production packages. A new wave of “producers” started springing up, that’s when cheap started. We started feeling the effect of this new technology as many of our clients opted for cheaper productions. None of these new guys with inexpensive equipment were marketing themselves as lower quality producers, their sales pitch was that inexpensive equipment made cheaper productions possible. We had to fight back. What we did was, we went to one of our previous client and asked if we could redo their video our way and for free. The only condition was that we would had to be able to use both videos as comparison to show potential clients. Of course it was a no brainer and the client went along. What we did we used the same script that the client owned and reshot the entire videos as we normally would. We then used the comparison to show clients the real difference, we had a 100% success. Quality alone wasn’t the only part of our new sales approach. We also added statistical information from marketing and advertising organizations showing that quality videos will engage the viewers while badly produced videos will drive them away. There are also studies made today showing that bad videos could potentially have an adverse effect on businesses, they could actually drive business away. Let’s take food as example. On higher budget productions and photography there are people who specialize only on visually enhancing food preparations just for the camera. Take Red Lobster and Olive Garden as example, even when you order the same dish as advertised it will never look the same as it did on TV, not even close, but you’re in there ordering it, mission accomplished as far as the photography is concern. This is what the viewing public is accustomed to see, high quality images. Now take some of the small restaurants using cheap videos to advertise their menus. I see it everyday and most likely their food taste much better than Red Lobster or Olive Garden, but it sure doesn’t look that way. Most of the stuff I see on these videos I wouldn’t eat it if it was free. Visual perception of quality is a very important marketing tool, this is why many companies spend more in the packaging of their product that in the product itself. The problem today, and this should be to our advantage, is that most people doing cheap videos, mostly for web sites, have no clue about the aesthetic of video and how important the right quality is to engage the viewers. This is not only art talk, this is visual psychology, it has to do with composition, lighting, depth, pacing and a lot more. It’s about visual marketing, it’s about engaging the viewer. Setting yourself apart from your competitors. Let’s face it, if your entire skill is based on storytelling and are trying to offer your services to the broadcasting or business community then take a number, a very long number because there are thousands like yourself doing exactly the very same thing for a hand full of available jobs. This is why you’ll see all the “no pay” ads on Craiglist. Even a “no pay” gig is hard to get these days. First and most important, THIS IS A BUSINESS. Start thinking like a businessman first and photographer last. I can’t really tell you what’s happening in your neck of the woods. Each area is different with different needs. This is why you have to be a businessman first. The basic for marketing remains the same regardless where you are or what you do. I can only tell you how to deal and how I dealt with the changing market in my territories and what I had to do to get and stay ahead of the crowd. The first thing that any businessman would do is to analyze and study his territory, don’t just throw the hat into the ring. Understand what the needs in your market area are, even better create new needs. The most basic rule for success has always been “find a need and fill it”. The old say in the business world is that competition is good for business, makes people sharper. I might question this but to stay ahead of your competitors you have to be sharper than the rest. Study what the competition does in your market area and do your damn best to be different, not necessarily better but offer potential clients something different, something that they are not getting now. If you are a good businessman you will find something, if not, then take a number and get on line. Remember, cheap is not a skill. Understand that because in the eyes of other professionals in your business you are a “better shooter” and get a lots of praises from your colleagues it doesn’t necessarily make you better in the eyes of a client. This is why many great photographers are broke. Being good doesn’t necessarily make you useful. Some of the elements that make us better shooters might mean absolutely nothing to a client, or not enough to get the job or pay a higher rate from what they can get from somebody else. To impress a new client from their point of view you have to be substantially and positively different from your competitor, and whatever you have to offer must benefit him. Talk intelligently. Do what successful marketing people do. Once you target a commercial client do your homework long before you make your first contact. Learn as much as you can about that client and the industry he is in. Learn about his competitors and what they do that he doesn’t. Don’t stop at the local level, study what larger or national firms within the same industry do in terms of videos. Chances are that they have a much larger budget. Study the video techniques and do your best to give the same look at your budget level. I’ll explain how I coped with this challenge. Most industries have associations, newsletters, web sites that talk about their industry, study those too. Always present yourself to a new client from a position of strength and not weakness. Selling a video project just because you want their money is weakness even if you don’t say it. Give the impression that you’re there to help them achieve a goal or fill a need that they might not even know they have. The more you learn about their business the more confident you’ll be and the more they’ll be impressed with you. I can’t emphasize this enough, but find something that make you different, not for your benefit but for the benefit of the client. It wouldn’t hurt to read a few books on salesmanship and marketing. Wasn’t always lighting for me, actually I started concentrating on expanding my lighting skills after moving to Florida in 1997, and the reason was that most shooters down here were horrific with lighting. I simply analyzed the market and grabbed the opportunity. When I worked in the Northeast everybody had basically the same lighting skills, every one was good at what they were doing. But down here it was a different market with different opportunities. Opportunity number two came from budget cuts. This would normally put people out of business, or create opportunities for others. Before the mid 90s on every medium to large job we had a grip truck. Budgets eliminated that but did not eliminated the needs of what a grip truck had to offer. Gradually we’ve expanded our equipment package to include a lot of what a grip truck was offering and made it part of our regular package. After seeing how younger “photographers” conduct business these days and reading some of the hair raising posts on the many forums and social sites I felt obligated that I should say something about. Out of all the posts that I placed on many forums over the years this one will be the most ignored. If I might suggest that you bookmark it so next time that bills comes due and there’s no money in the checking account you refer back to it. Let me give you some sobering statistics, over 80% of new small businesses start-ups fail within two years? To make these statistic even worse, these numbers are from when the economy was good. The number one cause of failure is poor planing or no planning at all, the business is up and running, the operating expenses are in place but nobody knows where or when will the money come from to meet the operating costs. People going into a business without having any idea of where they’re going or how to get there. Let me give you an example, probably the worst way to get into a business venture. How many time do we see the question on this and other similar forums? “How do you guys get clients?”. Imagine, getting into a business, investing in equipment with no clues of where the money will come from. Do you imagine a mechanic asking around what tool should he buy to fix transmissions? This is typical of this business and the new generation of photographers. A business plan and a career made of two words, “wing it”. So what exactly is this dreaded business plan that every business expert is so fixated about it? To put it in a simple words that everyone can understand, a business plan is a road map for your business, you tell it where you want it to go by giving it realistic information and goals, and if done correctly it will tell you if you are heading in the right direction. If the information and data that you entered in your business plans is incorrect and unrealistic it will get you lost, or out of business. The major difference between failure and success is of how accurate and realistic is the information you enter in your business plan. A business plan can be as complicated or as simple as you make it, and there are several ways to create business plans. Financial people will have different business plans for banks when going for loans, for investors when raising capital and one for their own company to monitor day to day operation. They all will (or should) show the same bottom line, how they get there might be interpreted differently. Considering that most in this profession operate as a one man (woman) business, the first step in building an effective business plan is to get a life plan together. Before you know where you business needs to be you have to know where your want your own life to go, not just next week, but one year, five years and ten years from now. What are your personal plans for your own future. When my generation was planning the future there were periods in chronological order of how the future will be shaped. It wasn’t a “must follow rule” but it was what most successful people happy with their lives were doing. First was the education, then have fun for awhile until you meet the right one, then get married, have children, buy a house in the suburb, save for kids education and build a nest egg for retirement. These were the fundamentals that needed revenue and how much revenue was needed was the number one entry in the business plan, better known as “Salary”. In the business plan “salaries(s)” is the first and most important of the “fixed expenses entries”, without people the business do not exist. After the human factor the plan should include all other fixed expenses absolutely necessary to operate the business, meaning that if there’s no money to meet those expenses might as well shut it down. After the fixed expenses comes the variable or operating expenses. Those could be gas for your car, travel, supplies, etc. If there’s no business of course there’s no need for variable expenses. Now you have a number that you have to meet every month in order to survive. If your sales are above those number than you’re operating in the black (making money). If sales and revenue match then you’re breaking even. And of course if expenses exceed revenue you’re operating in the red, bleeding money. There are tons of books on how to create an effective business plan for small businesses, I would recommend that everyone get some and start reading. The best way to start a business plan is for the next month or two is to keep track of every penny you spend both for business and personal use., no cheating, you’ll be cheating yourself. Once the list is completed separate mandatory expenses, obligations that you must meet every month from discretionary (six pack is discretionary), also separate expenses related to jobs. Once you have these numbers down you’ll know how much business you’ll need to get in order to survive. With each job also separate the costs. Just because you get $1000 per day doesn’t mean that you make $1000 per day. Depending on the type of business, the plan could be broken down by day, week, month or quarter. For our purpose monthly would be more appropriate. Of course the key factor in a business plan is revenue, making money is the only reason to be in business, otherwise it’s a hobby not a business. The first and most important step in every business is to analyze and study your market area, where will the money come from? This is where most photographer fail right out of the gate. They max out their credit card in buying equipment, build a web site, print business cards and after a few months they go to a forum and ask the question: “How do you guys get clients”. Kind of late for that. The biggest problem that I’ve seen in this business is that people make unrealistic plans or plans that hinge around fantasies rather than realities. I blame this on the many business “experts” that have been plaguing this profession like cancer. We’ve heard all those “experts” coming on this and other boards boasting about the future potentials of videos. The incredible demands of videos for the web as example, the tons of money that people will be making. Projections that never materialized and the only result has been to drag people into debt. Where are those experts now? They made their money and moved on to other audiences. Ignorance is abundant and very profitable. Those who believed and directed all their resources in that future potential are now nowhere to be found, they’re gone and they’re broke. The key word here is “WILL”. The future will always happen. Plan for it it and when it happens you’ll be ready for it, but never bank on fantasies unless it’s something unique and proprietary that only you can offer and there’s people out there who needs it. In few words, be realistic in your plans. The future will not be here in five or ten years, you will not wake up one morning five year from now and discover that the future has finally arrived. The future will start this afternoon, tomorrow morning and so on. Future is a gradual change with plenty of warnings. Stay current with changes, analyze and understand the changing market. Be mobile to move in any direction the market dictates. This is how successful people got that way. Getting back to the failure factor, can anyone guess what the main cause of failure is? Let me give you a hint, what’s the most popular complain about customers on this and other forums? If the answer is slow paying customers you’re right. So why is this such a problem? CASH FLOW/UNDERCAPITALIZATION is the number one reason for small business failures. Money goes out to pay for fixed operating expenses but there’s a gap from when the revenue is coming in. It comes to a point that there no more money to pay bills even thou there might be a healthy receivable. Experts unanimously agrees that any small business should have at least six months of operating expenses as cash reserve. The more the better. How many here have six months of operating expenses (living expenses included) saved as cash reserve? So what most of us do when the check finally comes in? As a profession we are gadget freaks, we love our toys, we look for reason of why we should buy something under the excuse that will generate more revenue. I’m guilty of that too, actually I’m the king of the gadget freak community, if it has an on/off switch I probably own it. The difference however is that in order to feed my gadget freak habits I never used my operating capital money. A percentage of my sales were always set aside for equipment purchases. I learn this the early days of my career and stuck by it for over 40 years. As I said earlier, this will be the most ignored post I have ever written, consequently this profession will also remain as one with the lowest generating revenue and highest number of failures of any other trade. Power of learning, the problem solving process. For what I’m about to say about 90% of readers will think that this is pure BS and will reach into the fridge for another beer. This expected response is right on target as from all those trying to make money with a video camera only 10% are capable of making a good living with their skills. Where you place yourself in this profession is all up to you. You and no one else have the power of your own success or your own failure. When I went to art and photography schools, and this was before most here were born, our method of learning was very different. Of course we had no web and the available resources were limited, but what we had was the best resource ever created, ourselves. We didn’t get to touch a camera until our third year. The first two years we spent it learning about images. We were taught from the very start that the equipment, whatever they might be, a brush and canvas, a pencil and paper or a still or film cameras were only recording instruments to transfer into something visible the work that was created in our brains. We had to study famous painting, photographs and films. Based on the disciplines of arts that we learned we had to take that work of art apart piece by piece in order to understand how it was put together. With a minimum of equipment that most of the time consisted of window light, white sheets for bounce or diffusion and black cloths to absorb light, we then had to recreate that work. We were never told how to do it, we had to find out on our own how it was done, it was a constant mental exercise. We were taught to go thru a process of accepting and rejecting a number of techniques and using series of logics until we found those that created those masterpieces. What we were unknowingly doing was going thru a problem solving process of accepting and rejecting numerous techniques until we found the right ones, and of course along the way as a process of elimination we were learning about all the different techniques. This is exactly the process that our brains go thru when solving problems, this is with everything we do and not just with photography or imaging. It was always a mental exercise. We were never spoon-fed information because even back then there was always the fear that if the brain looses the ability to look for solutions, just like any other parts of our bodies that doesn’t get used, it gets weaker. In this modern society most have become passive recipients of the information that our brains need to solve problems, this instead being and active participants in the creation and understanding of problem solving. Most people today do not even try or are incapable to search or formulate the answers, most don’t know how, they google it. They can only function if information are spoon-fed to them. There’s a misguided need of instant gratification in a profession that success is achieved by knowledge. Knowledge is bits of information that our brains were able to acquire and store year after year, problem solving is basically a function of our brains cross referencing that massive amount of information. If the information is not there then there’s little or nothing to cross reference with. Advancement in equipment technology do not create a photographers like many today would like you to believe. Better technologies is nothing more that additional tools in our arsenal but no individual tool is ever indispensable to perform our job. It’s the applications that our knowledge can do with new technologies that create quality work. In the history of creating images this is the worst that it has ever been as far as quality, knowledge and intelligence goes. This is also the worst that has ever been as revenue generating for most of those who decide to make a living with their cameras. This is the curse for those who become dependent and allow technology to do the work for them, they can no longer efficiently generate their own thinking process. Creativity can not be taught, its a brain function, it’s a problem solving process based on the information stored in our brains. The more information the better. This is why those that believe that the instant gratification of achieving in weeks what should take years are only cheating themselves out of opportunities to learn, because once the individual is convinced that he no longer needs to learn the brain will stop looking for information. Creativity is not just making beautiful pictures. Creativity is resourcefulness. Is the ability to make things happen. Engineers, doctors, financial people, etc. They all can be creative in their own field. It so happen that our field is imagery. Creativity is not a 9 to 5, Monday to Friday brain function, you either are creative or you are not. You can’t turn creativity on and off like an alarm clock. You can hand ten photographers the same equipment, give them the same assignment in the same location and be assured that they will all comeback with different results, some will be excellent and some will be very poor. This is because all ten brains will use different methods to solve the same problem, and the quality of the result will depend on what information (learning) is stored in each brains and how it was used. As I said many times before, the camera is nothing more that a dumb instrument that will record whatever the photographer’s ability is to create. The image do not take place in the camera, it takes place in our brains first, then we use our technological knowhow to transfer those pieces of information into a recording instrument. There are no short cuts in learning. Learning is an ongoing process needed to achieve a high level of proficiency and skills in any business. In this capitalistic society of ours the reward for our skills is of how comfortable of an income we are capable of generating and the level of success and proficiency is measured by the size of the checking account. Meaning that our skills are valuable to someone else, and the more valuable they are the better the compensation will be. By “high level of proficiency” I mean the ability of doing everything well throughout the entire scale of production and with every available equipment, not just picking up a camera and start shooting insignificant little stories that nobody cares and nobody is willing to pay for. Diversity is what’s needed today in order to prosper or for some even to survive. By diversity I mean the ability to provide services in every area of productions. It means the ability of changing direction at any time the market dictates and not finding yourself, like we’ve been reading way too often that as the business environment changes people can no longer generate sufficient revenue to even survive. Understanding the entire process of production means the ability to be able to do everything even thou you never did it before. It’s a system of logics that applies to every area of creating images. There’s no news, advertising, commercials, documentaries, feature, etc. It’s all productions. One of the most frequent question that I’m asked is “what lights should I buy” My answer usually is “buy whatever light will help you do to the job right” That’s where I get the deer in the headlights look. Most people today don’t even know what doing the job right means, most expect the equipment to do it for them. I’m using lights as a typical example but many question that I see asked are of similar nature across the entire spectrum of productions, equipment reliance taking over brain functions. Nowhere is the inability of problem solving more evident that in this business, our business should be the easiest to achieve total efficiency, that’s because the best teacher is right in front of us. We spend several hours each day in front of it, that’s our television set. Somebody else already created something and got paid very well for doing what most wished they could do it too. The results of successful application of skills are there in front of you. That’s your best teacher. The very simple formula to make money is to look at what work already made money and direct all you efforts and goals in that direction instead of paying somebody to teach you how to do make crappy little stories that nobody wants or are willing to pay for. Does this make too much sense? The teacher is there, learn how to read images on your own. I can’t stress enough the importance of this skill, it’s a most effective brain exercise. If you learn the technique of breaking down what the maker did you will also learn the skills of putting similar images together with the same efficiency and also with the same earning potential. But a word of warning, it will not happen overnight and advancement will be slow but steady. If you are one of those looking for instant gratification and a quick fix then don’t waste your time, this isn’t for you. Exercise your brain. Create virtual assignment. Learn to see the light. Next time you are at a restaurant or anywhere else think if this was an assignment, how would you handle it? You will suddenly start seeing all necessary element needed to create that scene. The beauty of virtual assignments is that you can do it mentally at your own pace without any pressure or deadlines. Who knows, maybe tomorrow that will be your assignment and now you’ll know what to do. As I said earlier, creativity is not a 9 to 5 job. Regardless if your video production work is for broadcasting, commercial clients or the web, before getting hired somebody will want to see what you're capable of doing. The difference between getting or not geting the job most likely will come down to what's on your demo reel. When budgets for TV and commercial productions started shrinking about a decade ago, necessary expenses like grip trucks suddenly became a luxury. Gone were all the goodies that made us look good and quality of productions started deteriorating. Producers however were still looking for quality work and crews who still could create the same type of work even with smaller budgets. Those who were able to achieve this prospered, those who didn't vanished. One of the most useful piece of equipment in my van that helped me conquer the budget blues wasn't even build for video production, in fact the only place you can find it is an industrial supply house, that's aluminum structural tubing. http://www.mcmaster.com/#catalog/118/1928/=irgw11 I also see it often on Ebay at a substantial saving. I started using structural aluminum after grip truck left with low budgets and everyday I find new uses. It's like when I was a kid playing with the only toy I had, an erector set, only today I'm making money with it. Let's start with the interior of my van, it's completely made on 3/4 (1") tubing. It's strong, lightweight and I can easily readjust the configuration to fit new equipment. Even the racks for the Matthew stands are made from the same components. We substitute the Allen screw with a Matthew hand bolts. This is soft metal and easy to cut to size, I recommend a small miter saw with an aluminum blade. 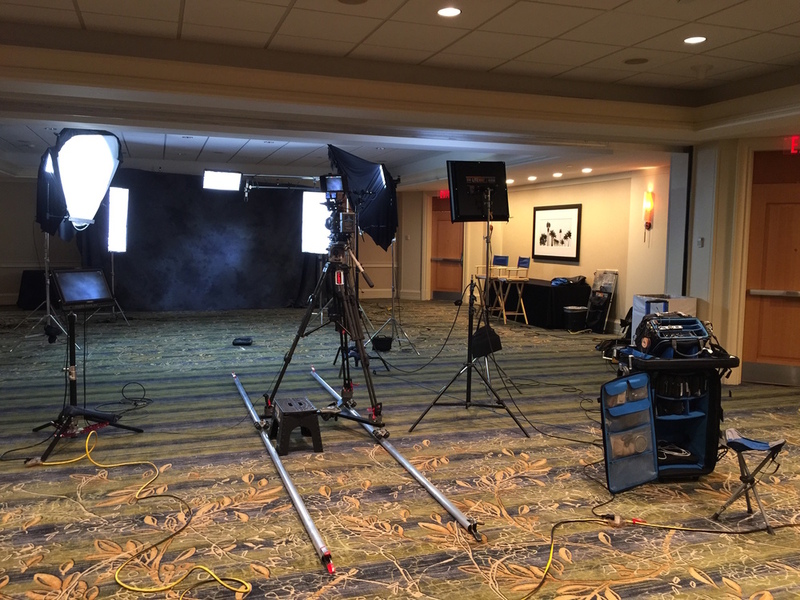 Setting up lights on ESPN's Gruden QB Camp was a real challenge. I wanted to use all Kinos but there's no place for stands, everything had to be mounted on the ceiling. Unfortunately regular ceiling scissor clamps and the small drop ceiling track weren't strong enough to support the weight. The solution was to build frames so we can build the support across several ceiling tracks to better distribute the weight. For the 4x4 Kino we had another challenge, with the low ceiling of the room the light was mounting too low and interfering with the jib moves. Again we used remnants to make a custom frame so we can recess the mount further into the ceiling. See "GRIDS 2" on the Tips & Tricks section for additional uses of structural aluminum in productions. Sometime grids can save the day and make you look like a hero in the eyes of the producer. Few years back we were asked by ESPN to do a simple interview with back then BUCS coach Jon Gruden, simple enough, until we got there. The team was moving into their brand new, state-of-the-arts headquarter, but there was a little glitch, the building did not receive the final CO (certificate of occupancy) therefore, except employees no one was allowed to enter the building, we had to do the interview outside. The specs for the interviews however called for a black "limbo" background, normally one of the easiest set-up to do, all we needed was darkness. We built outside a 10"x 10" x 20" frame all out of tubing and covered it with every black cloth and duveteen I had. Looked more like a gipsy camp residence but got the job done and done well. BTW, this was in August in Florida. Fortunately we were able to build the tent in a covered area between two building so we did not have to deal with direct sunlight or rain. The temperature quickly soared to 115 degrees inside and making sure that coach Gruden would be comfortable and semi dry for 15 minuted became our prime concern. We went to Walmart and bought a large storage bin, filled with ice and placed it inside the tent, we then placed a small fan to blow air into the ice, the air coming off the ice was cool enough to make the interior of the tent comfortable. Instant AC. If there’s one technique that most video makers are very good at, it is complaining. We’ve heard them all, the hit parade of complaints. Then, we have the “customers do not understand what it takes to make a video” complaint. They think it can be done for a few hundred bucks. I could write 3 pages from all the complaints that I hear and read every day. The reality is that the supply of video makers far exceeds the demand for videos. The silver lining is that there are still plenty of videos being done and somebody is getting that business, but evidently not those doing the complaining. The famous old cliché, “when the going gets tough, the tough get going” applies to this business more than ever. Let’s first start understanding that we are not in the video business, but we are in the business of video. The word business comes first. The days of; getting an education then buying a camera and calling ourselves artists and expecting that all doors will open for us, are gone forever. Today, everything is a business. We either handle it as a business or we will join the “complaining generation”. The days of the shotgun approach in this business are gone. The days of specializations are here. The only difference is that in order to stay in business and prosper, you might need dozens of specializations. This meaning that your marketing and technical knowledge must be diversified enough to become an expert in many areas. People do not want to hear about videos, they want to know what videos will do for their business. The general approach of “videos are good to communicate” will only lead you into the “complain generation”. Before approaching any business, you have to learn about that particular business and about the particular industry, meaning ‘do your homework’. First, before making any marketing plans, learn to pick the battles you can win. Next, you have to understand about businesses. For any business generating a 10% pre-tax profit is very good. Very seldom you’ll find any businesses making much more than that, most do below that mark. Meaning that for a small business that has a half a million in annual sales, its PT profit will be $50,000. Asking such a business to spend even as low as $3K to make videos is asking to cut deep into the profit. It would be acceptable if you could prove with actual numbers, and not fantasies created by some bloggers, that their investment will realize a higher profit. Those statistics however do not exist, so all that business owner has to go with is the word of the guys who are trying to sell him a video. Not a very trusted argument. People in this business think that other video makers are their competitors, this is not true. There are many others with more convincing arguments after that 10% of net profits. Local TV and cable companies are after that money too. So are local radio stations, newspapers, direct mail coupons, etc. The difference between you and them is that the client knows them, he watches TV, listen to the radio, read the newspaper and shop with those coupons. Also, all these people that are after his money come equipped with solid and credible statistical information. This allows the business owner to target his marketing dollar in order to get the best returns. This is the biggest stumbling block with people today trying to sell video services to small businesses. There is no believable proof that videos will actually help in achieving higher sales. Video, like any anything else, is an expense/investment and everyone wants to see what the ROI (return on investment) will be. Unless you can show that with real statistics and studies, you are wasting each other’s time. Does anyone remember the old Clint Eastwood’s inspector Callahan movies, particularly his quote in Magnum Force: “A man’s GOT to know his limitations”? The same quote applies to many video makers today. Actually, with the level of skill that many possess today, they are lucky if the clients do not understand what it takes to create video productions. At least they stand a chance to get some work because if that client would be knowledgeable, theywouldn’t stand a chance. I have yet to meet a video maker saying that his work is mediocre, but that their work is just the very best. Unfortunately, many think they really are. They are the best at what they know, but that’s not saying much. In order to make it in this business, you have to be the best in what your potential client needs you to know. This is where most video makers today fall way short, meeting client’s demands and needs. There’s a very simple test that one can do to see how much he really knows about video production. Look for the best videos you can find, not the cheapest. Can you do what was done in that video? Do you have the skills and the equipment necessary? If you intend to purchase equipment, invest for something that will benefit your own market. Can you create videos to be the closest as possible to what you’ve seen? How much more do you need to learn and where can you find some of the equipment that you’ll need in order to achieve those goals? What you see in those good videos is your real competition, not those who give away their work for nothing. If you try to compete against the cheap guys you’ll never make any money. Always make your best effort and expand your skills to compete with the best, not with the cheapest. Do that and soon you will look down at where you came from and feel sorry for those who are still there. This is where all the strategies come into play. Selling sand in the desert most likely makes for no/low demand, water on the other hand can be a business to be considered. In few words adapt your business to your present market. Also doing the thing we love to do with videos might not necessarily translate into sales. Everybody loves to make travel videos or music videos, and it looks like everybody is doing it. It’s fun and it’s glamorous but there’s no money there anymore. On the other hand, creating videos for a company that specializes in making power equipment for septic systems might not be glamorous but there might be plenty of work there. First, of course you have to find out what your own market consists of. What businesses are there that might become potential clients? Start your search. There are many sources such as Chamber of Commerce and Industrial directories where you can find the types of businesses operating in your market. Search the web sites of these businesses and see what they use now. Realistically, you have to think about which of those could benefit from videos and at what level of videos. Forget about the notion that everybody can benefit from videos, that’s blogger’s talk. Isolate a group of similar businesses in a specific industry. Now that you’ve narrowed your search expand it beyond your immediate market area. Find out everything you can about that particular business, not just about video but about the business itself. See what other similar companies and competitors nationally, even worldwide, do about marketing and merchandising (and of course if they use videos). After accumulating a good knowledge of that particularly industry, start working on ideas and concepts of how videos could benefit that industry. Don’t corner yourself, keep it wide open. Videos can be used as training, marketing, product demonstrations and just plain corporate identity, any or all of the above. After you have all this information and a good plan, now it’s time to approach a potential client. By you learning about the industry you are now marketing yourself from a position of strength, you now understand the potential client’s needs and you have a solution. Show them what others in the same business, potentially their competitors are doing. You’ll find out that suddenly you’re no longer a video-maker trying to sale videos, you are a video consultant. You no longer market videos, you market solutions. Now that you learn about this industry, move on to the next one and start all over again. This is how you diversify your business and expand your market. Every year I faithfully attend the NAB convention in Las Vegas. that's the best way to keep informed on new equipment and new trend in this business. This year I name the event the year of the slider. I have never seen so many companies making sliders of any kind. We've been using small dollies and sliders before they became fashionable but for the most they were made for heavy cameras. The introductions of small and lightweight cameras has created an entire new way of shooting. Keep it moving seems to be the name of the game today. Below is the flex track available from VariZoom for about $500. We bought one after seeing it at NAB about 4 years ago and it's getting a lot of use. Basically it's a 50' long 2" rubber round that can be shaped to move in many directions. Caution it require a special modified dolly also available from VaryZoom. Because the tracks is flexible and will not stay at the same distance the dolly has a small pivoting arm that swings over the track automatically adjust the rollers to the tracks separation. We modified one of our portable dolly rather than buying a new one. The other advantage of the flex track beside making dolly moves is to reposition the camera in a different angle to give the shoot the impression that many cameras were used. It's cheating but producers love the idea. This only work if two camera are used leaving one to maintain continuity. Another gadget we use frequently, and producers love it, is the trolley available from The Camera Turret Company. The two picture below show our that we modified so we can mount the power hear with the camera above the tracks for standard moves or below to give the fly over effect. The tracks are 3' long sections and can be added to form any length as there's a support every 3'. For flying overhead 9' or 12' is the maximum length I would use as the only support is t both ends, depending of course on the weight of the camera. The trolley is full powered including the camera head for tilting and panning. Camera Turret will have available soon a computerized control that can be programmed to perform every desired moves. This is also ideal for doing time lapses as the motor on the trolley can be adjusted to move extremely slow. The photos below represent a small selection of the sliders shown this year at NAB. To start we have to distinguish the main difference between two entirely different types of video productions, the ENG and EFP. Many people in the business today don’t even know what these stand for. ENG stands for Electronic News Gathering while EFP stands for Electronic Field Productions. So what’s the main difference between the two. The simple explanation is on ENG assignment you shoot what’s there with none or very little control of what’s happening in front of the camera. On ENG you have for the most full control and you have to know how to create what the camera will see. It’s a bit more involved than that but this is a good start. On EFP the camera becomes a secondary tool, it sits on a tripod while the photographer assemble, create and light what the camera will see. Many assignment are a combination of both, ENG and EFP. We might spend two third of the day creating EFP sets and the last third shooting b-roll to go with what the person being interviewed was talking about it. Needless to say, ENG is much easier for most videographers to do than EFP, so when you send a reel to a producer that contains a lot of concerts, scenics, convention floors activities or anything else that the photographer had no control over it but all it was needed was somebody to point and shoot, you can very well see that it has very little value to a producer or decision maker. 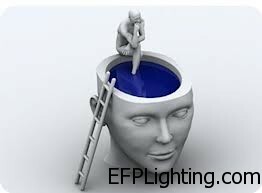 The most common type of EFP type assignments are interviews, the same interviews we seen on TV everyday. This is where the most career’s fatal mistake is made by most TV photographers today, and that’s underestimating the importance of interviews skills. This is the first and most important skill that most producer look for when selecting a crew. It’s the barometer to gauge just about every technical skill that the photographer has. It only makes sense that when a producer is looking to hire a crew the only thing on his mind is his own career. A skilled TV photographer can make that career while a bad photographer can wreck it. As I also hire over one hundred crew days a year understandably I get inundated with call from people looking for work. Very very few have what it takes. My suggestion to them is, learn as much as you can about lighting skills, once you know those everything will slowly fall into place. Everybody can shoot videos of concerts, that's what I see the most, all that says is that you own a camera.